North Korea has agreed "in principle" to accept verification by International Atomic Energy Agency (IAEA) inspectors of its denuclearization, in line with repeated demands from the U.S. to take concrete steps toward nuclear disarmament. "Nuclear negotiators from the United States and North Korea reached a tentative agreement under which IAEA inspectors will have access to nuclear and missile testing sites in the North for verification of their dismantlement in due time," an official familiar with the matter told The Korea Times, Tuesday. The official said how and when the inspections will take place will be addressed in follow-up working-level talks. Speaking on condition of anonymity, he said specific dates and places, as well as programs for IAEA visits to North Korea, and other details will be dealt with in the discussions. "North Korea will guarantee the safety of IAEA inspectors and their activities until the verification process is complete. Pyongyang will comply with its obligations under the U.N Security Council (UNSC) resolutions to cooperate with the IAEA and properly address outstanding issues," according to the official. IAEA inspectors were asked to leave the North in 2009. North Korea signed the Nuclear Non-Proliferation Treaty (NPT) in 1968, then violated and withdrew from it in 2003. The official said it was too early to talk about the North returning to the NPT. A Cheong Wa Dae official said the presidential office had no official comment. North Korean leader Kim Jong-un vowed "complete denuclearization" of the Korean Peninsula including the permanent dismantlement of all facilities at the regime's Yongbyon facility, in the presence of U.S. and IAEA inspectors at his first summit with President Donald Trump last June. Chief U.S. nuclear negotiator Stephen Biegun said recently the United States policy toward North Korea remains on final, fully verified denuclearization. Biegun said this means the elimination of all weapons of mass destruction, their means of delivery and the means to produce them. The IAEA said earlier it was continuing to enhance its readiness to play an essential role in verifying the North's nuclear program if a political agreement was reached among the countries concerned. 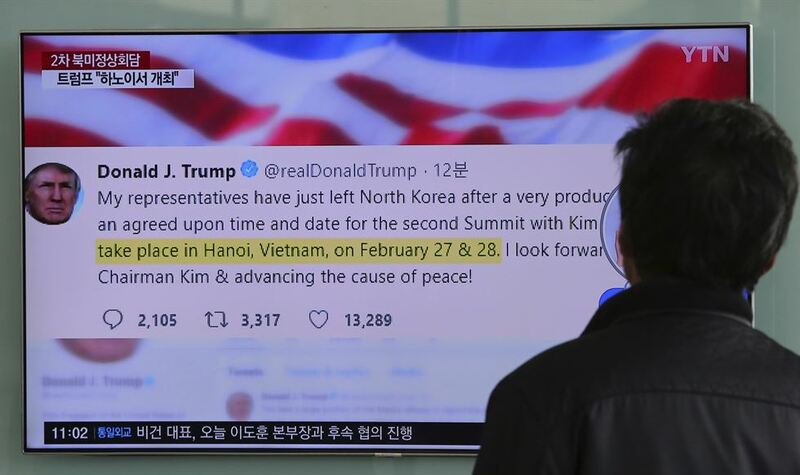 Political analysts in Seoul said both Trump and Kim will offer flexibility and concessions to reinvigorate the engagement process at their second summit to be held in Hanoi, Vietnam, later this month. The United States-led UNSC may grant permission for an early reopening of the Gaeseong Industrial Complex in North Korea as a reciprocal measure, while any decisions for wide-scale easing sanctions placed on the North are unlikely to follow immediately, even after the summit. "The establishment of a U.S.-North Korea liaison office in Pyongyang is also planned as a symbolic gesture for greater trust between Washington and Pyongyang," the official said referring to Biegun's recent remarks on the North at Stanford University in California. There, Biegun said there were four areas of potential cooperation to develop discussions with the North including a plan to transform bilateral relations. The chief U.S. negotiator stressed the United States has no plans to invade North Korea and the announcement will help Kim articulate his ideas for a global public relations campaign, a positive factor for Trump to claim a "historic win" in stabilizing the North. "While Pyongyang hasn't tested any missiles since late 2017, it has yet to dismantle all nuclear sites and facilities. Its slow progress has been underlined by the fact that Washington has not set a hard deadline for denuclearization. That gives Trump time to pitch the idea in 2020 that he needs another term to finish it, and that only he can do this," analysts at political consultancy Eurasia Group said in a recent note.